The count down has officially begun! Day 1 of the advent calendar down, 23 to go! 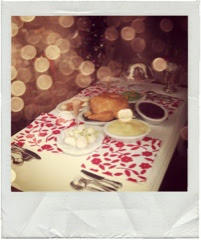 Mainly because I wanted to show off the Turkey dinners by Frippery factory some more but also to share week 48's project, Lazy table linens! There's really no real secret to this weeks project. I wanted to dress the table for Christmas and had some fabric scrap laying about, i'm not really a fan of full table clothes as they never seem to drape right so the slightly more contemporary runners and place mats were what I opted for. For the runner measure and cut a strip of fabric to cover the length of the table, ensure there's enough for an equal amount to hang over each end of the table. If you're worried about fraying seal the raw edges with some fray check (i use a little tacky glue which works just as well.) and if you're feeling really pro active you could press the runner flat. I cut the ends into a tapered point to look a little fancy. For place mats I cut x 4 equal rectangles...the end. Ha! I used co-ordinating fabrics for the runner and place mats though my table wasn't big enough to have both at the same time. You could play about with sizes and styles or really push the boat out by adding some beads to the runner ends? What ever takes your fancy! 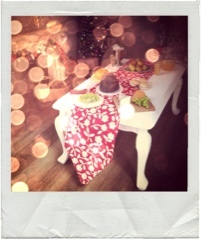 Hope that's given you some ideas for your own mini Christmas table?! I'm planning a little giveaway what with the festive season being in full swing so pop back on Sunday to see what goodies are up for grabs!